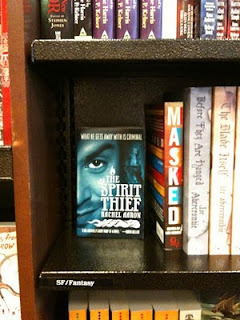 I've heard numerous reports of The Spirit Thief being spotted on bookstore shelves, but now we have photographic evidence! Hooray!! Eli looks so handsome next to his bookish brethren! 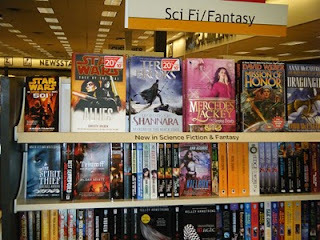 If you happen to be in a bookstore over the next few days, poke your head into the fantasy section. I'd love to know if this is a fluke sighting, or if Eli is truly out for real. Unfortunately, my husband has been sick as a dog with walking pneumonia since last week, so I haven't gotten a chance to haunt bookstores myself. He has very poor timing! 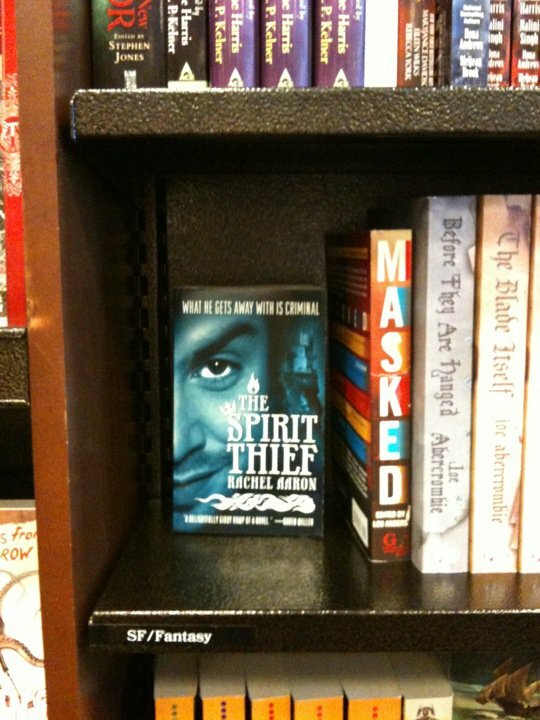 However, as soon as he's not a pathetic creature, I'm going to go to the Athens bookstores and haunt the shelves. Also! I finally got my act together and go on Twitter (as shown by my nifty new ticker on the sidebar). Come check me out if you're into that kind of thing, I promise I'll try to be interesting. 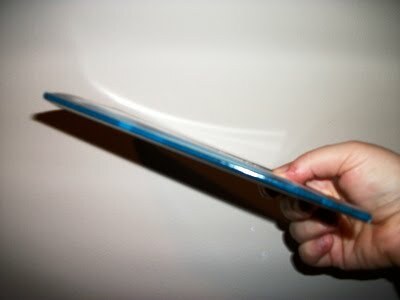 I'd post pictures, but honestly you probably couldn't tell the difference unless you were holding it, other than the size. 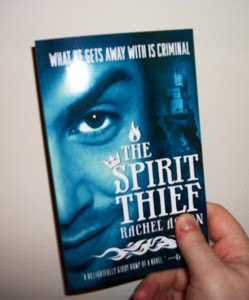 So just imagine a trade paper back with the Spirit Thief's cover (seen in the side bar) and you'd be on track. 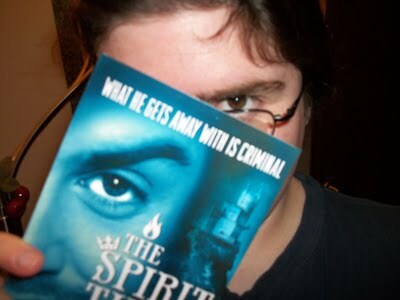 More reviews are coming in, including this one from Sporadic Book Reviews. 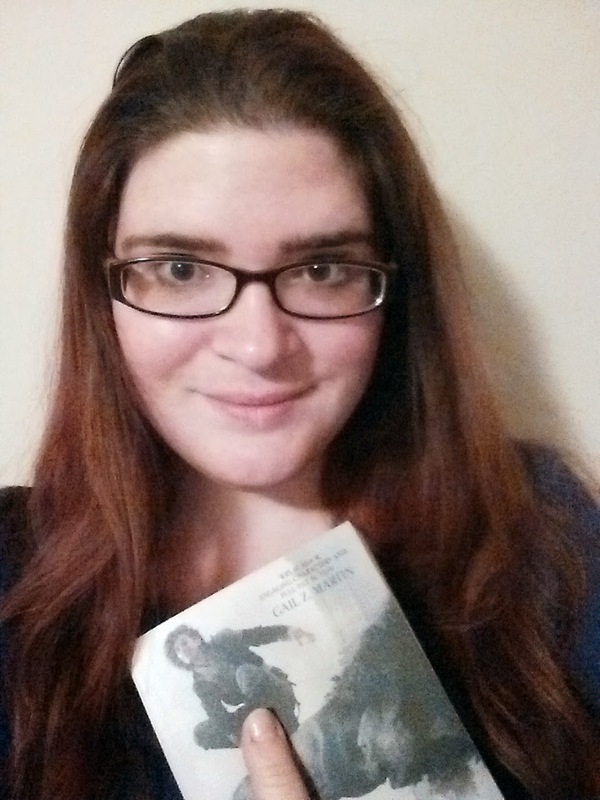 I don't think I will ever stop feeling giddy and humbled when people review my books! 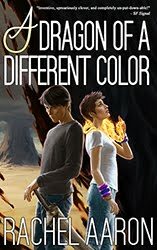 Also, there have been reports of people getting their books in the mail from preorder already, 2 weeks from the launch date. Gun jumping? Maybe, but if people are happy, I'm not complaining. I am going to start preordering more books I want, though. Books 2 weeks early? Yes, please!